Nobody really knows what Nikola Tesla would have been capable of, if he’d somehow had the unlimited resources and scientific support needed to research, test and implement all the off-the-wall ideas bouncing around in his mind. As it is, we only have glimpses of his potential, and the ability to imagine what might have been. One of his most visible projects was the tower at Wardenclyffe, located on Long Island, New York, and reported to be the first step toward wireless broadcasting. The tower, under construction in the early 1900s and finished in about 1907, was dismantled in 1917. It is said that Tesla held initial tests of the Tower in 1903, but just days after these tests, his dream was destroyed when creditors from Westinghouse confiscated his heavier equipment for nonpayment for services rendered. In 1917, the 187-foot tower was destroyed by dynamite explosion as ordered by the U.S. government. Thanks to the help of the website “The Oatmeal” and a kickstarter campaign, building a museum dedicated to Tesla’s work is underway on the site of Tesla’s research laboratory and the original foundation of the tower. While it’s hoped that a replica of the tower will be created, we may not ever know how it was intended to operate, as much of Tesla’s brilliance was kept alive in his own memory and thought processes, and rarely written down. What we have is an incomplete idea of Tesla’s potential and only a partial understanding of his contributions. What we really have is, Remnants of Tesla. 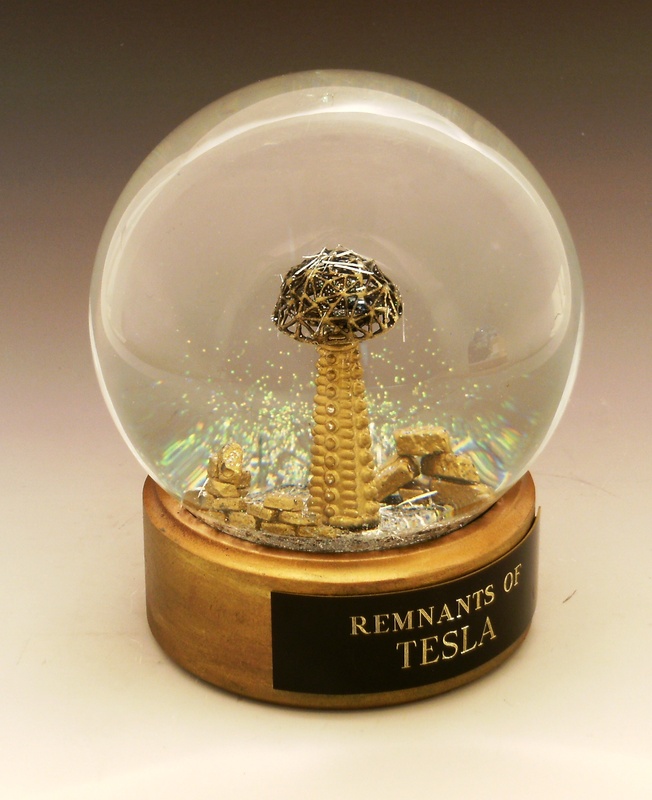 Remnants of Tesla, one of a kind snow globe sculpture, miniature tower created from repurposed vintage jewelry. When shaken, slivers of bright silver flecks give the appearance of liquid electricity and wireless energy. All images and design copyright (c) 2014 Camryn Forrest Designs, Denver, Colorado. In August 2012, in collaboration with internet cartoonist Matt Inman (TheOatmeal.com), The Tesla Science Center at Wardenclyffe (TSC) group launched an internet fundraising campaign that ultimately raised $1.37 million and eventually succeeded in purchasing the 16-acre industrial property, including Wardenclyffe and the original tower base. For more information on the progress of the Tesla Science Center at Wardenclyffe, read this. Did you know that a group of butterflies may be properly called a kaleidescope? Such a pretty and fitting description of the flashing colors and fleeting glimpses. Just like in real life, with real butterflies, if you blink — they’re gone! 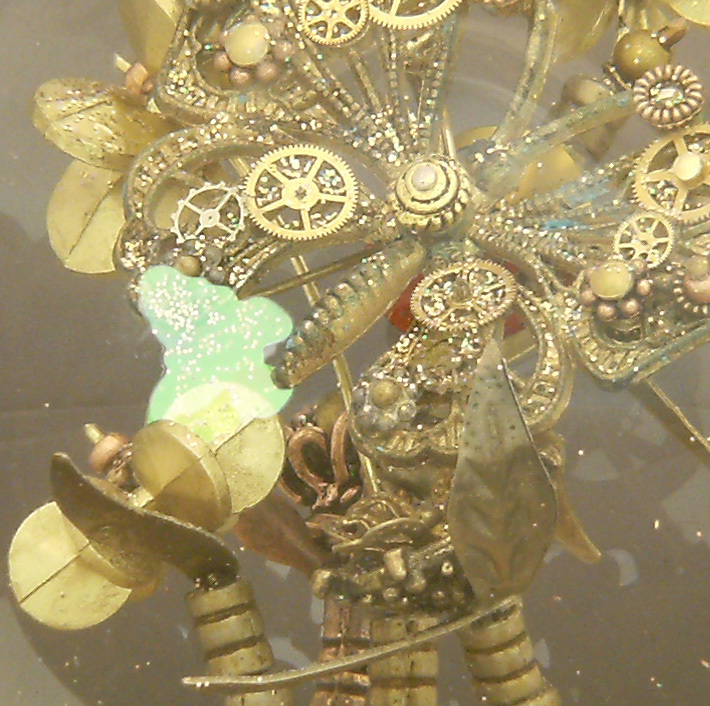 In this custom snow globe, a single metal butterfly rests delicately on a flower petal of repurposed bronze and copper. But shake the globe — if you are keen of eye — and you may see a kaleidescope of butterflies rain all around for a moment, then vanish again. 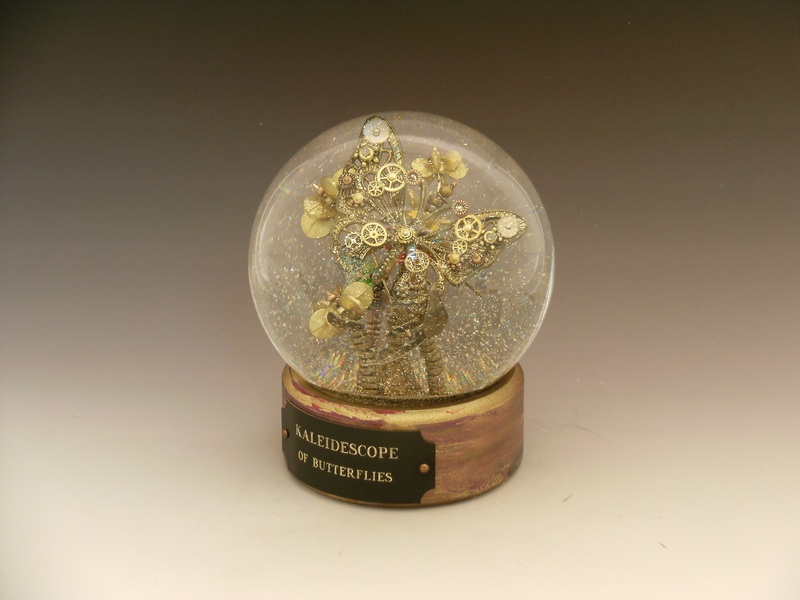 Kaleidescope of Butterflies, one of a kind snow globe using repurposed vintage jewelry, toys and watch parts. All designs and images copyright (c) 2014 Camryn Forrest Designs, Denver, Colorado. Well, here’s our take on it: Disco Baby. Complete with a bedazzled rhinestone base. Ooh, la la! If the slide gallery will cooperate, you can almost imagine he’s dancing the night away. 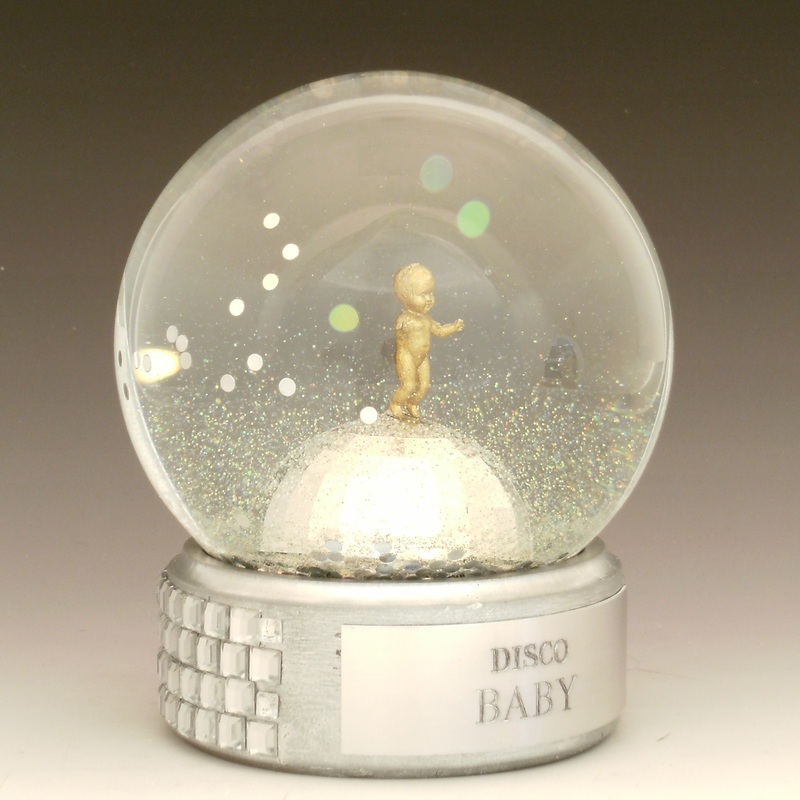 One of a Kind “Disco Baby” custom snow globe/water globe with acrylic jeweled base, and reflective silver and iridescent disco dots in liquid. All designs and images copyright (c) 2014 Camryn Forrest Designs, Denver, Colorado, USA.